But Wittgenstein told us that flying to the light is the wrong thing to do. The fly in the fly-bottle must fly to the darkness to be free. 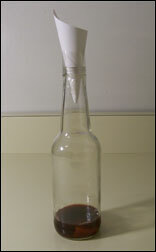 A fly-bottle uses sweets to entice a fly to fly in. But only darkness at the opening at the top. The only way out is to fly to the dark. The fly is trapped because people hate the fly. Though you are in fact no better than the fly? What if the sweets that trapped you are what you love? What if what kills you nourishes you? What if Wittgenstein was wrong when he said death was not an event in life? Perhaps death is part of every event in a life worth living? What if freedom means not flying away? It tells you truly that you must fly to the dark to be free. But to choose to be bound by what you stand for.